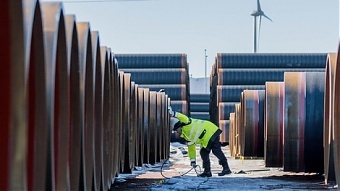 Project developer Nord Stream 2 AG on April 11th received the second of two permits required to construct and operate the planned natural gas pipeline in the Finnish Exclusive Economic Zone (EEZ), completing the permitting procedure in Finland, informed BC Nord Stream’s press service. The permit was granted by the Regional State Administrative Agency Southern Finland in accordance with the Water Act. The first permit received last week was the Government’s consent for the use of the Finnish EEZ. “This is an important day for our project: following a very thorough analysis and extensive engagement the Finnish authorities have approved our detailed plans to construct and operate the 374-kilometre Finnish section of the 1,230-kilometre Nord Stream 2 Pipeline. We look forward to continuing the constructive co-operation with the authorities during the construction and subsequent operation phases of the project as they monitor the implementation of our plans,” said Tore Granskog, Permitting Manager Finland at Nord Stream 2 AG. The Finnish permitting procedure was initiated in autumn 2017 after the environmental impact assessment (EIA) phase, which was a pre-requisite for proceeding to the permitting phase. The EIA and statements received during the consultations are used as a basis for decision-making in permitting. Nord Stream 2’s Finnish EIA report was awarded a “Good EIA Award” by the Finnish Association for Impact Assessment in March 2018 and was credited for the inclusion of an extensive amount of information about the project’s implementation alternatives and their environmental impacts, among others. During the process, extensive consultations were carried out with various stakeholders. All necessary permits needed for the project have also been received in Germany. The national permitting procedures in the other three countries along the route – Russia, Sweden and Denmark – are proceeding as planned.